I've been fascinated by board games that revolve around drafting for years now, and in early 2011 I wrote a post on the pillars that make these games click. Not long after that I started working on a game (then called City Draft) that would be strongly inspired by a few key influences: 7 Wonders for the mechanics and structure, Carcassonne for the idea of placing tiles in a grid, and SimCity for the theme. I touched upon it briefly in an October 2011 post that said it was improving steadily, and I've been working on it off and on (under the name Draftopolis) ever since. I've created an online prototype for playtesting that has seen almost 2000 games completed with at least a dozen players clocking in at over 100 games apiece. The rapid feedback and iteration cycles enabled by this level of playtesting mean that the game is currently in fantastic shape. 1. Guilds are based largely on factors outside of your control. For a variety of reasons, the decks for each age in 7 Wonders are fixed from game to game. The one exception is that each time you play, you randomly select some guilds to shuffle into the Age 3 deck. These guilds mostly provide variable point bonuses based on the types of buildings the players to your left and right have built. This means that finding effective guilds feels largely random since you can't plan your strategy around them and each individual guild is only good if your neighbors happen to be pursuing certain strategies. The best you can do to influence this is to ensure that you have the appropriate resources to play guilds that would be good for you, but even then there's a good chance that a given guild isn't in the deck at all. There's a large setup cost to having a selection of cards that are separately randomized at the start of each game, but with a few tweaks I felt that the potential payoff was more than worth it. The simple solution was to move the guilds to the first era (calling them "cornerstone" tiles instead) and to make them dependent on your own strategy rather than those of your neighbors. 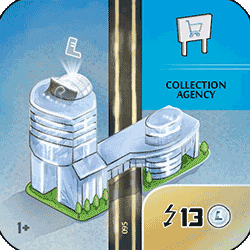 One example would be the Environmental Agency, which is a Civic building that grants victory points for spaces in your grid that 1) don't have a building and 2) have no nearby pollution. 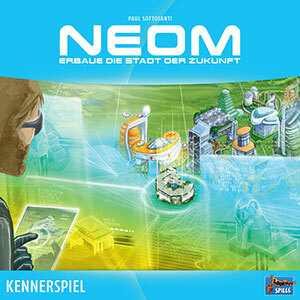 This leads to cities with wide open areas of undeveloped nature that either purchase all of their goods from other players or carefully position their industry in a corner surrounded by their other buildings. With 25 different cornerstone tiles that could show up, successive games of Draftopolis feel very different from start to finish. 2. Science is purely all or nothing. One of the core qualities of a solid drafting game is that players value the same cards significantly differently based on their position. In 7 Wonders, this manifests to an extreme with Science, which is nearly useless unless you commit heavily to it. Often you find yourself in a position where the player behind you is picking up Science cards and the game comes down to whether you're willing to spend early picks hate drafting them (torpedoing both your chances) or whether you let them through, nearly guaranteeing their victory. And if you choose the latter option, everyone at the table blames you for letting them win. In Draftopolis the role of Science is filled by Residential tiles, which are worth increasing numbers of bonus points when they're placed contiguously into neighborhoods. The key difference is that I later stumbled onto the idea of including a thematically appropriate rule (called the "Ghost Town" penalty) that states that cities without any Residential tiles lose 10 points, and cities with only one lose 4 points. With this, all players have a large incentive to at least dabble in Residential and competition is ensured for the high value tiles within that category. In addition, the bonus flattens out after the eighth Residential in a neighborhood, rather than continuing to grow exponentially. 3. Few viable paths to victory. In the base set of 7 Wonders, there are only a few strategies that can consistently win games: mainly heavy Science (when it's underdrafted), Military (with pacifist neighbors), or resource heavy (leading into some high value Civic buildings). The Commercial (yellow) strategy has a tough time winning due to the poor exchange rate of money to victory points (3 to 1) and heavy Civic (blue) strategies simply can't compete with other plans that end up earning points more efficiently. That said, the Leaders expansion does a wonderful job of fixing this problem without adding significant amounts of complexity. Draftopolis utilizes the cornerstone tiles and more favorable point conversions for money strategies (1 VP for each $2, with players capable of ending games well over $100) to open up the playing field. 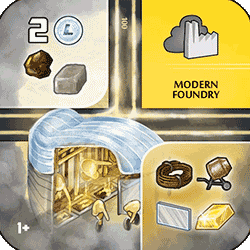 Residential focused, Commercial focused, and Industrial focused strategies are all viable, as well as hybrid builds revolving around efficient tiles and/or one or more cornerstones. 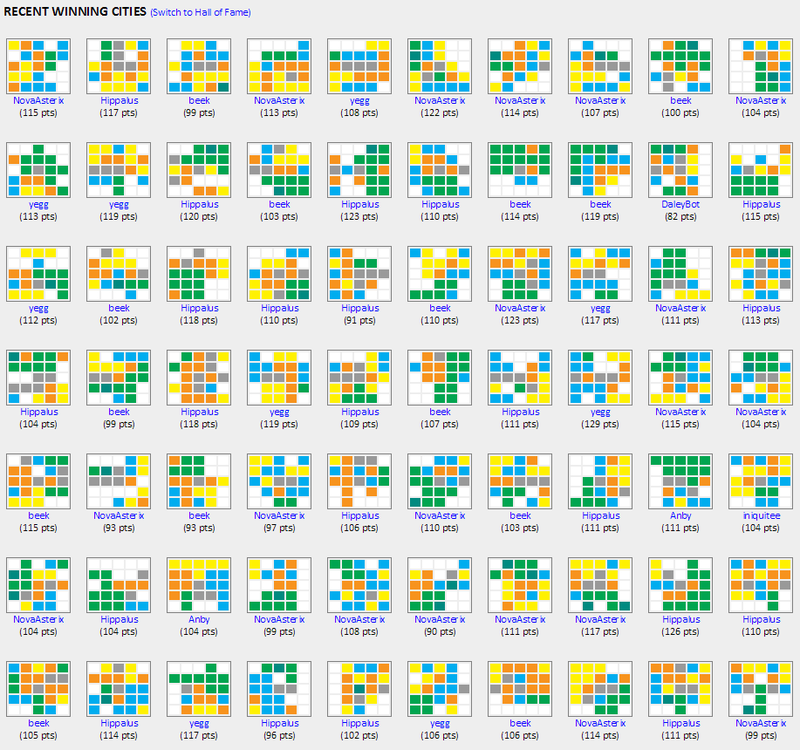 This display of the recent winning cities shows off the relative diversity of strategies that can do well. After a card is picked in 7 Wonders, there are only three choices of what to do with it: play it, build a stage of your wonder, or sell it. As the wonder option is often unavailable due to resource constraints, and selling is rarely worthwhile, this leaves only one real choice most of the time. 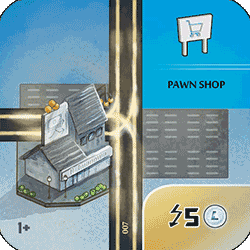 By contrast, Draftopolis features a 5x5 city grid that each player is independently filling with their tiles, with available trade routes on either side that provide benefits when a road is connected to them. 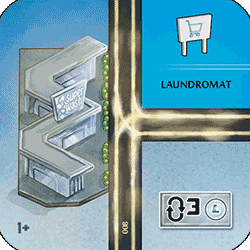 The choice of where to play early tiles can play a crucial role in how a city develops into the mid and late game. A key decision that I settled on early in the process was that tiles can't be rotated, as the combinatorial possibilities of tiles, placements, and orientations would result in analysis paralysis for a lot of players. I do feel that the placement decision layer adds significant skill to the game, and it does so without adding too much time since everyone decides where to put their tiles simultaneously. 5. Static sell values and trade costs. In 7 Wonders, cards in later ages are significantly more powerful and valuable than early age cards. Yet the return for selling a card remains $3 throughout, and selling a card in the third era (for the equivalent of 1 VP) is an almost surefire way to lose the game. Similarly, the cost for purchasing a resource is always $3, which is a massive commitment early game and a relatively small pittance late. Draftopolis scales both the trade cost and the sell price throughout the game, increasing by $1 per era. 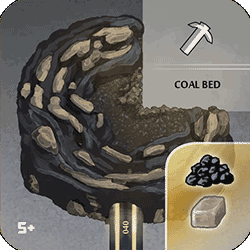 This softens the "noob trap" elements of the sell option, and commodity-focused strategies are more rewarding since each sale will bring in the equivalent of 2.5 victory points in the final era. EDIT: After playtesting this rule some more, I've changed the design to use a $5 static sell value and trade costs that only depend on the tier of the commodity being sold. Both of these values can be listed directly on the playmat and players don't have to go through an additional step to calculate the cost or benefit of a potential trade or sale. 6. Players can only interact with their direct neighbors. Being sandwiched between two resource light players in 7 Wonders can be devastating, as many buildings and wonders require multiples of a single resource in their cost. Situations where you know that someone across the table is running away with the game without any way to affect them can also be frustrating. For Draftopolis, I originally allowed players to purchase resources directly from the bank at a steeper cost, but this added complexity and created awkward decision points where you had to decide whether it was worth it to pay extra to avoid helping out your neighbor. I eventually settled on a replacement solution of allowing resources to be purchased from anyone at the table with a $1 transport fee for each player between the seller and buyer. If a commodity such as Steel isn't being produced yet, then everyone is in the same boat of being unable to play tiles that require it. In addition, disaster tiles give players a way to affect players across the table, without introducing direct attacks or other mechanics that would call for political posturing. 7. Militaristic neighbors can further invalidate strategies. 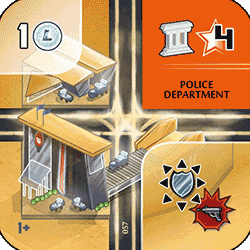 When a player wins with the military strategy in 7 Wonders, it's often because one or both of their neighbors chose to eschew building red cards at all, letting them get maximum military points with a very small investment. On the other hand, neighbors who are willing to fight for military superiority put a player into a decidedly worse position pretty much from the get-go. 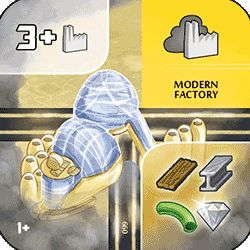 Draftopolis allows full control over trade routes (by making it a permanent feature of the game board rather than a card that must be drafted) as well as the cross-table resource purchasing, so players have the tools to react to any situation that their neighbors might create for them. Sometimes trade routes will be hugely valuable, and sometimes it's better to cluster one's buildings to make them easier to protect with Fire or Police Departments. Complaints about table position have been few and far between in my experience. 8. The pass direction is inconsistent. When I watch new players try out 7 Wonders, the number one rule I see them mess up is the swapping of the pass order in the second era. Even experienced players often forget which way the cards are being passed, which can slow down the game or cause issues with the packs as they travel around the table. I originally had cards being passed the opposite way in the second era in Draftopolis, but eventually came to the conclusion that always passing left is simply better for the game. It's easy to remember and makes it clear which neighbor you should be paying attention to when settling on a plan. 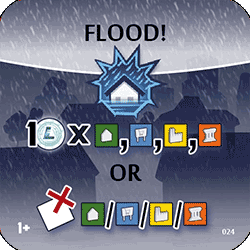 In games where you play your drafted cards immediately, you have perfect information about what strategies your neighbors are pursuing, and therefore you can always make an informed decision. 9. More players mostly just means more copies of the same cards. This does ensure that you're playing the "same game" when there are more or fewer people, but it's also boring, and it relates directly to the next most common rules mistake that I've seen: people playing second copies of the same card. Double checking that each card you want to play doesn't have the same name as a card you already have is both time consuming and not particularly fun. 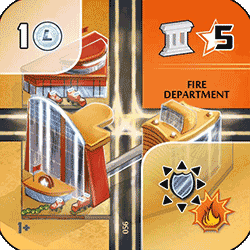 In Draftopolis, every tile is unique, and each additional player results in new possibilities and potential city configurations. There also aren't any rules that prevent the selection of a tile because of tiles already present in a city. Games with different numbers of players each have their own unique flavor, and certain strategies are slightly stronger or weaker depending on the number, further increasing the replayability of the game. 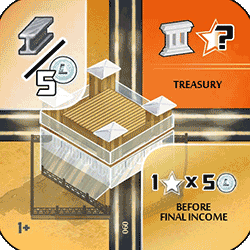 For example, the Treasury is only available with five or more players, and it enables a strategy focusing on Commercial buildings that produce lots of upfront cash as opposed to a more traditional build favoring high income tiles. 10. With 6+ players, you never see the same pack twice. Last but not least, with six or more players in 7 Wonders, you'll never see the packs that you open ever again. And with seven players, there will be packs opened next to you that never make it to you even once. This cuts out a significant aspect of drafting strategy ("tabling" cards) and contributes strongly to the perception that there's nothing you can do about someone across the table who's doing well. Of course, this problem is easy to "solve" by just adding tons of cards (or tiles) to each pack, but that comes with its own set of problems: choices being overwhelming, the play space getting too crowded, etc. For these reasons I started testing Draftopolis also with seven tiles per pack, but I soon settled on the sweet spot being eight. Any more and it starts getting difficult to fan them out in your hand, any fewer and you start losing the "tabling" aspect as mentioned above. With the maximum number of players (six) you still get a second tile out of each of your opening packs, and with three players you even get a third. Draftopolis is a game that borrows heavily from 7 Wonders in many respects while simultaneously attempting to strike out in a bold new direction. It plays quickly but has far reaching depth, and after hundreds of games I still find myself agonizing over turns with regularity. I'm also starting to think seriously about looking for a publisher, so hopefully you'll be able to play a tabletop version of the game sometime within a year or two. Thanks for reading and I'd love to hear other takes on both 7 Wonders and my proposed solutions in the comments! To my knowledge, it isn't yet common for games to be commissioned in the way that works of art were commissioned by patrons throughout history. Yet that's exactly how Hokra, by Ramiro Corbetta (with audio by Nathan Tompkins), came to be. Hokra is a 2v2 sports game where the teams are fighting over control of a single ball. When a player doesn't have the ball, she can sprint, and when she does, she can pass in any direction. Sprinting increases speed but removes the ability to change directions for a short while. Sprinting through an enemy player stuns him briefly and causes him to drop the ball. Scoring is achieved by maneuvering the ball into one of the team's colored zones in the corners, and counts whether or not the ball is currently in a player's possession. The first team to fill up the counter in their scoring zones wins. I first played the game at IndieCade and instantly fell in love. A few simple mechanics (passing, zone control, sprinting, tackling) come together to make a deep and compelling multiplayer experience. The refined aesthetic calls to mind a top down view of a hockey rink and provides a simple backdrop for the competitive gameplay. If commissions to a single designer are going to result in games like this, I hope the practice continues to flourish. What inspired you to make Hokra? When I began working on Hokra, I was just trying to program a simple passing mechanic. I had been playing lots of FIFA10 at the time (well, I still play it a lot), and to me passing is by far the most interesting mechanic in soccer games. So I put a square player on screen, then a smaller square ball. I was interested in getting the concept of passing in the direction you were pointing with an analog stick to feel just right, so I created simple 2D ball physics and a system where the longer you hold A, the stronger your pass will be. It was very straightforward, but that was the point. I wanted that feeling that when you made a good pass, you did it because you were very accurate. A friend of mine who is also into soccer was coming over one day, so I added a second square player and we tried moving around the “field” and passing the ball back and forth. The game (or, really, the toy) was already surprisingly compelling. How did you settle on the victory condition of having the ball in your team's corners for a set period of time? At this point, I decided that I should turn what I had into a proper game. Making it a two-on-two game was a no-brainer since I wanted a game about humans playing against each other and a one-on-one game wouldn't involve much passing. My first instinct was to make a game about scoring goals, or at least getting the ball to go through a goal, giving your team a point each time you did it. Before I even implemented that, I realized that in such a small field it would probably be more fulfilling to try to hold the ball over a “touchdown” zone than to just get it into a goal. I put the zones in opposite corners for symmetry. I assumed I'd come back later and change it because it wouldn't just work out. I really thought there would be a lot of iteration with the scoring conditions and the placement of the goals, but it turned out much better than I expected, so I stuck with it. Why did you decide to make it a one button plus analog stick game? The next step was making it so that players would want to pass. As in real life sports, I wanted players to be slower when they had the ball. In order to do that, I allowed players who don't have the ball to sprint. At first, you'd press A to pass and X to sprint, but a friend asked me how come I was using two different buttons seeing as you can't pass when you don't have the ball and you can't sprint when you do have the ball. I told him I had thought about mapping both actions to the A button, but had never gotten around to it, which is a pretty bad excuse. I made the change on the spot (it was a one-character change in my code). Some friends still complain that sometimes you are sprinting toward the ball and you end up passing it by mistake (I've made tweaks to attempt to fix that problem). They ask me to go back to the two-button setup. I quite like the fact that you only press one button, though. The game was originally commissioned by the NYU Game Center for the 2011 No Quarter Exhibition, where lots of people would be playing the game for the first time, and they'd be doing it in a public space. Many of those people would not be gamers. I'm sure you've noticed that when people who don't play games that much are told to press the X button, they have to look down at the controller to figure out which one is the X button. I didn't want that problem to get in the way of people who were playing Hokra for the first time. Analog stick + A button makes the game more approachable. I'm always happy to make my games more approachable if I don't have to compromise on depth to do it. When I was first working on the game, I was calling it “the sports game.” Obviously that wasn't going to stick. As the No Quarter Exhibition approached, Charles Pratt, who curates the event, told me that he needed a name from me. After going through a bunch of ideas, including SquareBall (which I liked, but was already taken), I started looking at names of Indigenous Brazilian sports. I'm originally from Brazil, and there are a few words in our Portuguese that come from Indigenous Brazilian languages. I ended up finding this sport from northern Brazil called rõkrã, which is similar to field hockey. This isn't a sport I knew about growing up, but it's similar to field hockey (a coconut is used as a ball and it's played barefoot, which sounds pretty scary) and I liked how the name sounded. 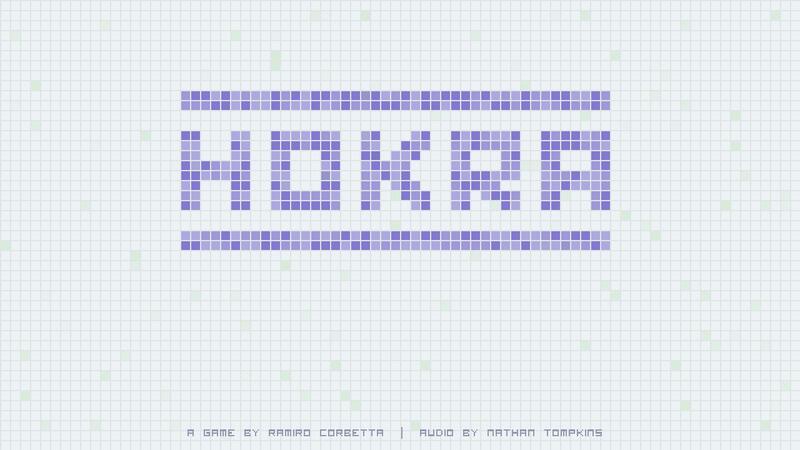 I changed the R to and H because, with an American pronunciation, Hokra sounds more like the original name than Rokra. What's your favorite memory of playing or watching others play Hokra? I have two really good memories. Toward the end of the night at the No Quarter Exhibition, a game that was being watched by maybe 15 people got extremely exciting. There was a lot of back-and-forth and the crowd was really getting into it, making loud “uuuuuhhhh” noises whenever somebody did something special. The game was really close, and when it ended the crowd broke into applause. At that point I felt like I had gotten the spectator aspect of sports right. The second memory happened when the Hand Eye Society guys invited me to show the game in Toronto. It was July 4th and I was in Canada with two other NYC game developers who were also showing their games. At one point we ran the Canadian Hokra Tournament, and once we had a winning team a couple of us stepped up to challenge them for the North American tournament. The whole bar was watching the game, and when the Canadian team beat us, the entire place broke into “O Canada.” Some of my Canadian friends said that Hokra sparked a rare moment of Canadian patriotism. What game designers inspire you the most and why? Fumito Ueda was a big influence when I was starting out as a game designer. Playing Ico made me realize that I definitely wanted to create games for a living. It's interesting that now I make games that are really different, thematically, from his. 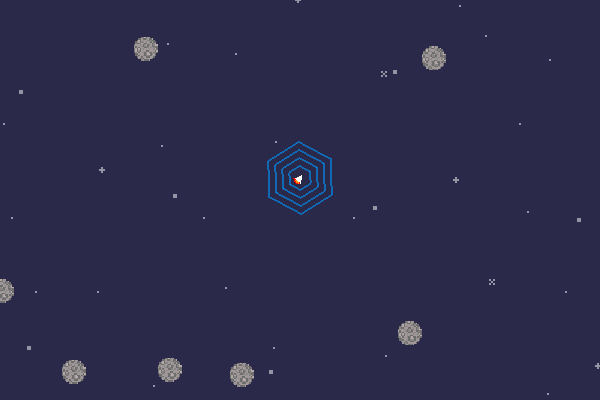 But I think that his minimalist design aesthetic is still a huge influence over how I make games. I think that it's hard to find a game designer who isn't influenced by Miyamoto's work, but I still need to mention him here because of how brilliant some of his games are. Finally, these days, I'm probably most influenced by a game designer who happens to be a friend, too – Doug Wilson. His games, such as B.U.T.T.O.N. 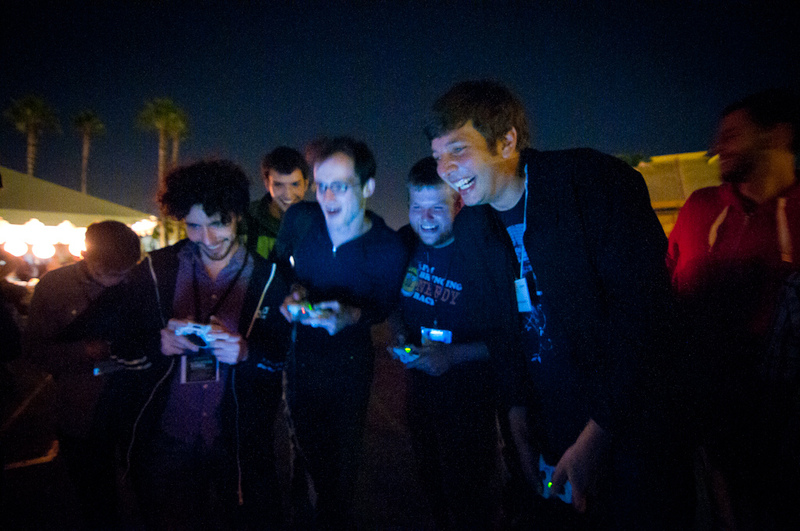 and Johann Sebastian Joust, are some of the most interesting multiplayer games I've played in a long time. His work is not only absolutely amazing, but it's also really inspiring, affecting how I make my games more than anybody else's work does. You have won a prize. The prize has two options: the first is a year in Europe with a monthly stipend of $2,000, and the second is ten minutes on the moon. Which option do you select? When I first read this question I thought it was ten SECONDS on the moon, so going to Europe seemed like an easy decision. Now that I know it's ten minutes it's much harder, but I think I'd still take the European trip. As amazing as the ten minutes on the moon would be, I think my life would change more by spending a year traveling around Europe while creating games. That is if $2000 per month is even enough to travel around Europe these days. On Friday I'll be giving a talk at IndieCade alongside Chris Hecker entitled A Dialogue on Depth. It's rather surreal to see my name in a list with a bunch of indie luminaries, but hopefully I'll be able to live up to expectations. As Chris pointed out, though, we're in a timeslot opposite the Experimental Gameplay Workshop, and pretty much everyone in their right mind will be over there, so it should be a small and intimate gathering. Thanks to that we're planning on involving the audience during the talk. City Draft - This 7 Wonders inspired drafting game is consistently liked in playtests and has been improving slowly and steadily. I've recently changed the rules to allow players to buy resources from any other player at the table, which opened up the possible strategies nicely and evokes a more interactive feeling in the gameplay. I'm also playing around with adding more "build around me" tiles that come early in the game, so that players can have a direction and get especially excited about tiles that they might be able to pick up later. At the most recent playtest, one 7 Wonders fan said that he actually liked this game better, and another player mentioned that she couldn't wait to buy it in stores, so hopefully that will happen sometime soon. Prison Break - This is the experimental cooperative game with restricted communication (for the first half) and realtime aspects (for the second half). I thought I was onto something here after I hit a design breakthrough a few weeks ago but I'm getting discouraged again based on recent playtests. The game feels too easy, doesn't have enough strategy, and doesn't seem to quite evoke the feelings that I'm looking for. I think I need to go back to the drawing board on some of the core mechanics and try to find something that's more interesting and involved. Maybe I'll get a chance to playtest it at IndieCade and see if people have some ideas. Dungeon Game - This 1v3 competitive game has a great core mechanic and then a thick layer of RPG elements and high variance on top of it. I'm currently torn as to whether or not the added complexity from the RPG elements is worth it. Dan Kline was already inspired by the core mechanic to work on a much simpler version of the game with a different theme, so I think I'm going to keep this as a dungeon crawl for now, and look for ways to simplify the game without losing much of the flavor and depth. I think the greatest chance of this design seeing the light of the day is to pitch it to Wizards of the Coast as a good fit for the D&D IP, so I'll be looking to do that next time I'm in Seattle. People who enjoy RPG experiences tend to have a great time with it. I also have one more design that's currently in Cryptozoic's queue for publication, so with any luck I'll have a couple more games out in the market in the next year or two. Good times! In Seattle right now, happy to be done with the talks so that I can relax a bit at PAX before heading off to Burning Man. The talks went well; as with anything they could have been better, but I learned a lot about presenting and I'm excited to apply it next time. Tonight I'll be on the Hollywood Squares - Game Design Edition panel, 6 PM in the Kraken Theatre. I've added a new (short) page to the site with a list of my panels and talks as well as slides for the Practical Systems Design talk. Feel free to contact me if you have any questions on what I spoke about. After three ink cartridges, twenty five sheets of perforated business card paper, and a whole lot of work in Illustrator, the business cards are finally done. There are currently 50 unique cards, and I'll be bringing five copies of each to PAX (with the exception of a group of ten that lost one each of their comrades in the process, so those will be a bit rarer than the rest). I'm calling the game Sprite Wars, and the rules set is a fairly simple modification of Tic-Tac-Toe. Players should be able to learn it very quickly, ideally from just watching someone play. It should be playable in only a couple of minutes. It should only require a few cards per player. It can't require any sort of additional materials and should be playable on pretty much any small flat surface. These are wildly different goals from most TCGs that you would find in your local store. Whenever I'm trying to make something that people can pick up extremely quickly, I find it makes a lot of sense to start from a game that everyone is familiar with and innovate from there. In this case, the image of little pixel characters surrounded by arrows pretty much instantly popped into my mind, which took me in the direction of using the rules and victory condition of Tic-Tac-Toe. Those who follow me on Twitter might have seen me agonizing over the design of the front of the cards. I wanted something to ensure that people looking at the front would notice the back, ideally in an organic manner so that I wouldn't have to keep repeating "and look at the back too!" to everyone. Originally I had small text at the bottom saying "flip me over! ", but it made the card feel cramped and I had to squeeze multiple things on one line. After a bunch of advice I ended up just going with some simple arrows on the sides; they don't explicitly tell anyone to turn over the card, but they hint at it and they nicely reference the arrows on the back that drive the gameplay. That said, I now regret adding them. What I didn't realize is that I was going to have some issues with getting the printing to line up, especially on the fronts (which I printed second, regrettably after waiting a few days, giving the ink-laden paper time to warp). Without the arrows, small differences in alignment wouldn't have been noticeable. With them, it's sadly obvious, and worse, it "marks" the cards for the game because savvy players will be able to remember the arrow placement on their different cards and know what they're about to draw. Then again, this is just a free game on the back of my business cards, so it's really not that big of a deal, but it's a good lesson for the future. All told it probably cost around $60 or $70 in ink and paper for 240 cards, which seems like a lot, but for full color, double sided cards with 50 different unique designs, I'm pretty happy with how it turned out. 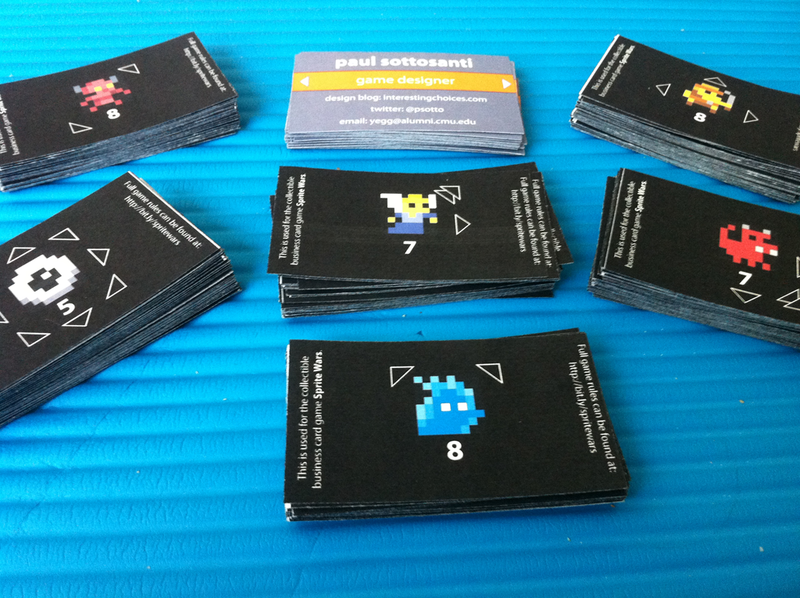 I'll be giving them out at PAX this weekend, so if you're there, say hi! I'll be a part of two talks at PAX Dev: Practical Systems Design in the Context of Darkspore (scintillating title I know) and Design Doc Do's and Don'ts, where I'll be talking about everything but traditional design docs. At PAX itself I'll be spending a lot of time at the SpyParty booth, or perhaps at the Cryptozoic booth as well, where they'll have some early copies of The Penny Arcade Game: Gamers Vs Evil, a game that I designed along with some help from Mike Donais and Matt Place. It's firmly in the deckbuilding genre, and takes inspiration from games like Dominion and Thunderstone, but also adds its own twist to things with mechanics like facedown unique boss loot and player avatars that grant a special ability and determine the composition of your starting deck. I've been a huge fan of Penny Arcade for as long as I can remember, so it was a huge honor to design this game for them. Can't wait for people to get a chance to try it out! Cooperative multiplayer is an oft-underused method of allowing people to play games together in a more accessible and casual manner. People are starting to warm up to it, though, and recent years have seen a surge of cooperative board games, as well as digital games like Starcraft 2 and League of Legends that are embracing co-op vs AI as a valid way to experience the game. There's something nice about winning or losing together with your friends, especially when one isn't in the mood for the intensity and cutthroat qualities of a typical competitive experience. 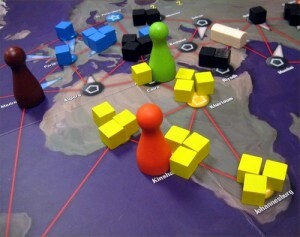 That said, there's a particular problem that's endemic to cooperative board games, which is that the game will present players with a puzzle, hoping that the group will work together to find a solution, and instead the single most skilled or most experienced player will end up playing for the entire group. It's just much simpler for a single person to execute a strategy than it is to get everyone on the same page and let them arrive at the best course of action themselves. Many games give each player a hand of cards, but in the absence of a rule that prevents discussing those cards, they often are just laid openly on the table to save everyone the trouble of having to continually ask what everyone else has. If I remember correctly, Pandemic actually recommends laying the cards down on the easy difficulty and then asks that players hold them in their hand on medium and above, but still doesn't restrict players from talking about them. That does help a little; players at least get to feel somewhat involved when they're asked how many red cards they have rather than simply told what to do. Not to say that those games aren't well designed and enjoyable overall. The list of games suffering from this problem is quite long: Pandemic, Forbidden Island, Ghost Stories, Castle Panic, Castle Ravenloft, and so on. Both Pandemic and Ghost Stories are heralded as some of the best cooperative experiences out there, especially when playing with people of roughly equal experience and skill levels. Still, any designer thinking about the cooperative space should have this problem at the forefront of their mind. The traitor - Betrayal at House on the Hill, Shadows Over Camelot, Battlestar Galactica, etc. Add in the fact that one or more players are secretly a traitor and suddenly players are no longer keen on playing the game for everyone else. Or rather, no one's willing to let their turn be taken for them. Then again, adding in a traitor does add a competitive element to the game, which you may or may not want. Real-time aspects - Space Alert is the king of this category. Not only are there hidden cards, but there's also a strict time limit and an audio track constantly throwing new challenges in the team's direction. Knowing this, Space Alert actually has the players appoint a captain, and everyone still gets to contribute fully because there's simply no way the captain has time to order everyone around. Hidden information plus restricted communication - For example, adding a rule that says that players can't talk about the cards in their hand. Games seem to be hesitant to pull the trigger here, and I can't think of an example at the moment, although I'm sure there must be one out there. My guess is that it stems from concern that players will have trouble interpreting a rule like this, or worse that they'll outright rebel against it. Richard Garfield talked about this in a podcast on cooperative games and also mentioned the idea of "communication as a resource", which I've been thinking about ever since. With the cooperative prison break game that I'm currently working on, there are two phases: the planning and the escape. 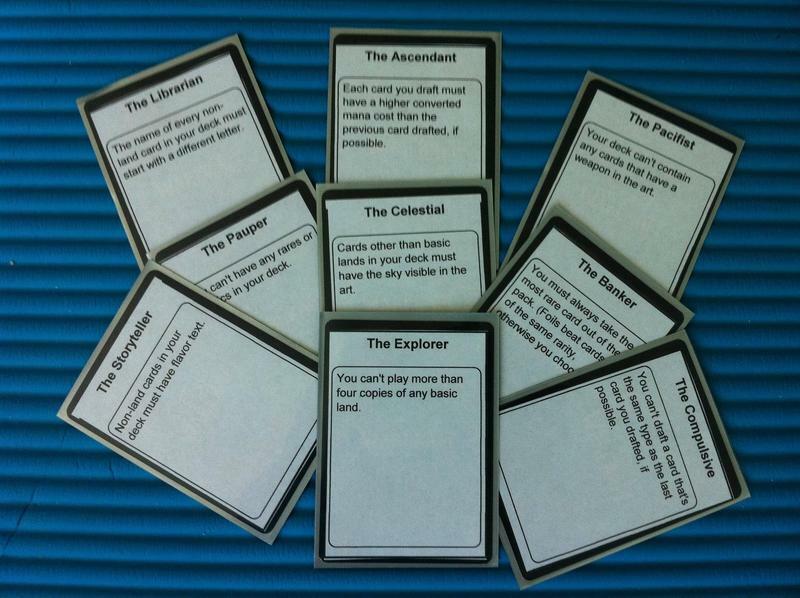 For the planning phase players are forbidden to discuss the game at all, and cards are played face down, but each player has two tokens that they can spend to show everyone else a card from their hand and describe where they're stashing it. The goal is for players to try to work together as best they can, planning what they'll need for the escape, with that limited channel of communication. When the actual escape begins, all restrictions on communication are lifted, but there's now a real-time element, with new obstacles showing up every fifteen seconds. Players have their objects in their hand and have to discuss what object or objects the group wants to use to solve that obstacle. Thanks to the timer combined with the hidden hands, players stay involved during this phase despite the open communication channels. Last Thanksgiving, I was drafting with a guy named Zak Walter who had invented a deck of what he called "draft conditions". They had evocative names like The Astrologist or The Pacifist and each one had a limitation on your drafting or your deckbuilding. Now, I'll never get tired of just straight up drafting Magic cards, but it was an interesting twist to the process as battles become more about the archetypes (who wins: the Pacifist or the Pugilist?) rather than the players. It also gave people a reason to draft fun decks, gave them an easy excuse when they lost, and just made the whole night a lighthearted affair. Not long after that I took the most memorable conditions from that night, brainstormed up a bunch of my own, added a few from Dan Kline, and made my first set of twenty conditions. These things really need a more evocative name: draft limitations? draft personalities? draft avatars? dravatars? I don't know. Anyway, Friday night I was drafting down at the San Carlos PopCap offices (where Plants vs Zombies was made by an extremely small team) and we tried them out for the first time. We had twenty conditions and twelve players so I gave everyone a random one and then put the remaining eight face down in the center of the table. If you didn't like your condition you were allowed to swap with one of the conditions in the middle, but you could only do this once. The Arkmaster - Each creature in your deck must share a creature type with another creature in your deck. I have high hopes for The Arkmaster although no one had it on Friday. It forces you to make some tough decisions if you open a powerful creature early with a rare creature type like "Sphinx" and should make you reevaluate your priorities even for more common creatures based on their types. The Ascendant - Each card you draft must have a higher converted mana cost than the previous card drafted, if possible. Brad Smith had the Ascendant, and it seemed to work out beautifully, providing lots of interesting choices. If you're not excited about a pack, you can take the most expensive card, hoping to reset your restriction as long as the next pack doesn't have anything even more expensive. There was also a natural reset built in at the end of each pack with the basic land that's often a fifteenth pick, but your neighbors can wreak havoc with that by selecting it and passing you a spell last, forcing your restriction to carry into the next pack. Brad opened a Flameblast Dragon and then was able to pick up a Volcanic Dragon in the very next pack since there wasn't anything costing seven or more. He was undefeated and seemed to have a great time. The Astrologist - Secretly write down a number before the draft. The converted mana cost of the cards in your deck must add up to that number. Stone Librande had this one, and chose to write down 70. Despite a couple bombs like Grave Titan and Serra Angel, it ended up being too high, and he was forced to play two Stonehorn Dignitaries in order to stay at 40 cards. Those kept coming up against me when he would've preferred drawing cards with more action, and I was able to take him down in three close games. Otherwise his deck performed admirably. This was inspired by the infamous MTGO "bottom right" drafts where you always take the card in the bottom right of the pack. No one had this on Friday, but I have a feeling it's one of the most harsh conditions, because you'll often spend a lot of time taking the worst uncommon out of every pack before you can finally start drafting commons. Might need a benefit to balance it out. The Builder - Your life total is 5 plus one for each card in your deck with a converted mana cost greater than three. No one had this either. I'm a little wary of it giving the player too much freedom right now. You can draft pretty much normally and still end up with 16-18 life, which should be plenty against the gimped decks of your opponents. I think I might change it to two life per expensive card and also increase the threshold to five mana and above. This one is a little weird because it's not a restriction as much as a temptation, but for now I'm giving it the benefit of the doubt. The Celestial - Cards other than basic lands in your deck must have the sky visible in the art. I enjoy the art based ones greatly, but this one does suffer from a lot of ambiguity. I'd say whether or not you can get away with using this one depends greatly on the group you're playing with. If they're easy going and are willing to trust the judgement of the player who has it then it's worth having. The Compulsive - You can't draft a card that's the same type as the last card you drafted, if possible. Laura Shigihara, who did all the music for Plants vs Zombies, had this one. I didn't get a chance to play her but I think her deck turned out well and she had a good time. I also enjoy how you can select the basic land to reset your restriction and open up your options for the next pack. The Elitist - Each creature in your deck must have a keyword or ability word. No testing on this one yet. Seems solid though. The Explorer - Your deck can't contain more than four copies of any basic land. I had this when I played at Thanksgiving and I had a blast drafting a five color deck. This time Tod Semple (the Plants vs Zombies programmer) had it and didn't enjoy it much. Part of the problem was that M12 doesn't have much in the way of mana fixing, and he's not a particularly seasoned drafter so he likes being able to focus exclusively on two colors and just ignore the rest of the pack. Experienced players will enjoy this one I think. The Fatalist - Before opening each pack, you must choose either "first 4" or "last 8". You must pick randomly for those picks during this pack. No one had this one, but after thinking about it more I'm planning on changing the "before" to "after" (decisions are often more fun when you have more info), "first 4" to "first 3", and "last 8" to "last 9". The goal with the last two changes is to make it more of an interesting choice; I think with 4 and 8 you'll pick "last 8" almost every time since that still leaves you 7 strong picks per pack. With 3 and 9 I think you'll have to mix it up. The Individualist - Your deck can't contain any two creatures with the same power and toughness or any two non-creature spells with the same mana cost. This one suffered from some poor templating (it's fixed already above) which caused some confusion, so I didn't get particularly good data on it. I think it's one of the more interesting restrictions though. The Jester - After opening each pack, choose odd or even. All cards selected during that pack must have that converted mana cost if possible. Dylan, Stone's son, had this one and seemed to enjoy it. He started leaning towards odd once he realized that the basic land often prevented him from picking freely when he picked even (we counted zero as even) though. Maybe zero should count as neither so that it's a more balanced choice. The Librarian - The name of every non-land card in your deck must start with a different letter. Seems like this will work although no one had it. The Opportunist - You may take two cards out of each pack that you open. You must play all of your cards except for the last and second to last picks. This was a disaster. First because the player misread the restriction and thought he could take two cards with every single pick, and second because I balanced it terribly. I don't know why I thought the occasional double pick was enough to offset having to play 42 spells in your deck. I just didn't do the math. I'm not sure how I'm going to fix this one but I'll probably start with changing the last part to "except for the last five cards of each pack", giving them 30-33 spells. The Pacifist - Your deck can't contain any cards that have a weapon in the art. George Fan, the designer of Plants vs Zombies, had this one and chose to go for a green/blue Turbo Fog deck after picking up an early Rites of Flourishing. He hit an early snag when he realized that Fog hilariously has weapons in the art, and then another when he saw that Merfolk Mesmerist is carrying a wand, but he stuck with it and got a second Rites and four Jace's Erasures. He defeated all comers until running into my aggressive Pugilist deck and then later falling to the Individualist's Elixir of Immortality. The Painter - You can't draft a card that's the same color as the last card you drafted, if possible. Straightforward, seemed to work well. Also can reset the restriction by selecting the basic land. There's quite the competition for those lands! The Pauper - You can't have any rares or mythics in your deck. Gives you a lot of freedom at the cost of having to pass up some powerful cards. Rachel Reynolds had this and drafted an aggressive mono-blue deck that unfortunately lost to the Pacifist thanks to two Kraken's Eyes. The Pugilist - Your deck can't contain cards that prevent opposing creatures from blocking your creatures (anything that grants flying, intimidate, protection, landwalk, etc). I gladly kept this one and drafted an aggressive W/G deck featuring Sun Titan, Dungrove Elder and Overrun. There were numerous cards I couldn't take but I was still able to put together a solid deck and ended up going 4-0. I enjoyed how it made for very interactive games and there weren't very many stalemates at all. The Sorcerer - Your deck can't contain more than nine creatures. No one had this one. The condition seems solid but the number might need a bit of tweaking up or down. The Storyteller - Non-land cards in your deck must have flavor text. Not a terribly interesting condition in a base set draft since almost every single card seems to have it. Overall I like it though. So that's the initial set. Overall they were a success but I plan to come up with some extra ones and start rotating them in and out and tweaking them as I go. Feel free to take these and try them out with your group. If you do, let me know how it went! New things are exciting, but you only get that initial burst of excitement once. Why spend the Planeswalker excitement on Future Sight, a small set that already had a "hook" (these are cards from the future, some of which will become real later), when we could save it to sell our forthcoming large set? As much as people argued that the "real release" of Planeswalkers would still be Lorwyn, I knew that players wouldn't see it that way. Future Sight was already far above average in complexity and wackiness, thanks to a new card frame showcasing "future" cards like Steamflogger Boss. The set really didn't need a whole new card type for players to have to learn. The Planeswalker team needed more time. No one was completely happy with how they worked yet, and the balancing of a new card type was proving tricky. We had no idea of their power level and could've risked printing a completely unplayable Planeswalker or one that was far too strong. In the end we compromised with referencing Planeswalkers on Tarmogoyf, a move that I think ended up being the best of both worlds. We foreshadowed Planeswalkers (and Tribal, for that matter) without actually showing our hand, which drove a lot of hype for the upcoming set. Of course, at that point no one had any idea that it would go on to become arguably the best green creature of all time. Around this time, Magic was going through somewhat of a creative reboot to make it more accessible and also better suited to supporting other potential media like books, graphic novels, or maybe even movies and TV. The goal was to have recognizable characters that could show up in multiple expansions (despite the different settings) that were relatable for players. Luckily, the IP already had an answer for this: Planeswalkers. And since the only way to get most Magic players to care about a character is to put a card depicting that character into their hands, it was time to add them to the game. I was a part of the team tasked with figuring out what this new card type was going to do. Unfortunately I don't remember much about the process, but I do remember that one of the original designs had them following a list of instructions. They triggered on your upkeep I believe, and they would perform the first ability in the list on the first upkeep, then the second, then the third, and then they would wrap around and do the first ability again. We arrived at this because it didn't necessarily make sense to let you control another Planeswalker; it'd be like asking your friend to come play basketball with you and then having to direct their every move. With the ability list we encountered the opposite problem: they felt less like sentient beings and more like robots, especially when they performed an ability that didn't make sense with the game state, like giving a creature +4/+4 when you controlled no creatures. We tried to get around this by giving them abilities that flowed into one another, like letting them create a creature before empowering it, but situations where the creature died in the meantime kept cropping up. Plus, it was sometimes hard to remember what step you were on, and marking them with tokens didn't work since you were already keeping track of their loyalty. Eventually someone hit on the idea of charging or granting loyalty for the abilities, and we changed it to let you choose which ability was activated. Then we let you activate them the turn you played them, which was a huge upgrade in terms of constructed quality and also just the overall feel. Suddenly playing a Planeswalker and having your opponent kill it on their turn didn't feel that bad. Overall I think the Planeswalker card type was a huge success. I know that Richard Garfield has expressed concern about the amount of complexity that was added, and I agree with him that it's unfortunate that a new player can get a card that works so differently from everything else. At the end of the day, though, they provide some great gameplay, your opponents can interact with them (through burn spells or attacking them), and I think they've contributed to the recent success of Magic. The Lorwyn design team was Aaron Forsythe, Mark Rosewater, Brady Dommermuth, and Andrew Finch, with Nate Heiss replacing Andrew partway through. I can't say enough about how much I enjoyed working under Aaron. He's as well rounded as you could hope for: strong design skills, with the playskill and understanding of a developer, a huge knowledge of the game's history, and enough business sense that he's now been the director of Magic R&D for almost five years. What I enjoyed the most though is that he's one of those people who, at the end of the day, just wants what's best for the game. When everyone on a design team puts their egos aside and works as a unit towards that singular goal it can be quite the magical experience. So much went on during Lorwyn design that I don't really know where to start, but I'll try to break it down into cohesive sections. Lorwyn takes place in an idyllic world filled with rolling pastures and beautiful forests. Where possible, we wanted to convey that through the cards and make the player feel the happiness and contentment of the world. One of the earliest ideas I had was to have a world without killing. Black wouldn't get any "destroy target creature" cards, and instead removal in this world would be themed as tricks and pranks, with the occasional application of -1/-1 counters. Using -1/-1 counters was potentially important because we knew that the last two sets in the block (Shadowmoor and Eventide) were going to be an evil version of the Lorwyn world, after a Cataclysm-type event, and at the time all of the sets in the same block had to use the exact same type of counters. There was just too much confusion from trying to support multiple different types of counters on the same card, and by keeping them out of the same block we at least kept those situations out of most sealed deck and draft experiences. This turned out to be a terrible idea. Not only did it have the anticipated problems of causing frequent stalemates (we thought we could solve that by seeding certain types of cards into the set), but the slow application of -1/-1 counters actually made the set feel more evil than most. You weren't just cleanly killing creatures, you were torturing them to death over multiple turns. We went back to the drawing board, and soon found ourselves bringing up the problem at another one of the Tuesday Magic meetings. We lamented the fact that we couldn't use +1/+1 counters, and people started throwing out suggestions, but none of them seemed viable. Eventually, as a joke, I said that this would be so much simpler if +1/+1 and -1/-1 counters would just annihilate each other, like matter and anti-matter. In hindsight, I guess there's no great reason why I thought it could never work, but as a designer you tend to quickly get used to the editor and rules manager telling you that ideas just can't possibly work within the rules. It's not that they're not good at their jobs, or that they're trying to stifle innovation, it's just that they're the ones who have to deal with all of the corner cases and who have to clean up the mess if anything breaks, and they're naturally a bit conservative. To my surprise, though, I saw them seriously considering it, and pretty quickly they said that it could function as a state-based effect. It didn't take long for the room to agree that with the support of that rules change, Lorwyn and Morningtide could use +1/+1 counters, and Shadowmoor and Eventide could use -1/-1 counters. Suddenly everything was so much easier. Early in the process we had a meeting to decide the plan for the first half of the block. Specifically, what would we leave for Morningtide so that it would feel like it's own set and not just an extension of Lorwyn? It was a unique situation because there were only two sets to worry about; Shadowmoor and Eventide were doing their own thing (focusing on color) even though they would take place in the same physical location. I started thinking about how we had just recently done the race/class update, where all cards now had a race (a card that used to be just "Cleric" would now be "Human Cleric") and all sentient races now had a class (instead of just "Elf" it would be "Elf Warrior"). I knew we should take advantage of that somehow, and quickly I hit on the idea of having Lorwyn focus on the races like a traditional tribal set and Morningtide focus on the classes, which hadn't specifically been done before. Since the cards all had two types, and each race would be confined to only a few classes, new possibilities would open up for existing decks when the class tribal cards showed up in Morningtide. The team was on board with the plan and it never changed again. We now knew how Morningtide would set itself apart, but that still left us to figure out how Lorwyn was different. We had all played Magic during Onslaught and enjoyed it, and we knew that just printing a bunch of cards with specific races and some other cards that enhanced them wouldn't be nearly as awesome the second time around. One idea that was rolling around, that I absolutely loved, was to apply the creature types to other types of spells. Essentially, not only would we have Elves, but we'd have Elven sorceries, Elven enchantments, Elven artifacts, and even Elven lands. This would solve one of those age-old problems of tribal decks, that you couldn't play any spells at all without diluting the tribal qualities of your deck. If you wanted 40 Goblins, you had to have 40 creatures. As an additional cost to play this spell, tap an untapped Elf you control. Play this spell only if you control an Elf. We went through the pros and cons of each of the team's suggestions, and eventually settled on the final one from the above list and calling it Mojo. It allowed you to play the spells even if you hadn't drawn any creatures yet still rewarded you for having the right type in play. Next we moved forward with designing Mojo cards, at least until we hit the next snag. Mark Gottlieb came to us and told us that "Instant - Elf", which was how we were planning on templating the cards, wouldn't work. The game rules didn't allow creature subtypes on anything other than creatures. We tried debating, but there were a lot of subtleties he was worried about, like old cards that said something like "put an Elf from your hand into play." You can read about more about this process in Aaron's article about Lorwyn. Aaron fought bravely for it but eventually saw the writing on the wall and gave in. Back to the drawing board. Of course, as you all know the set did in fact ship with Tribal cards. What happened? Well, a couple things. We tried some other options, like creating a little icon for each tribe and then putting those on the sorceries, but it forced awkward "whenever you play an Elf or [elf icon] spell" wording that everyone hated, so we abandoned that. I found the set far less exciting without our marquee mechanic, and ended up sending at least one impassioned email to Aaron to try to find a way to fit it back in somehow. Aaron asked Mark to keep trying, and he soon came through for us and found a way to make it work. If we created a new supertype called Tribal, and one of the qualities of being a Tribal card was that you could have the creature subtypes, the rules suddenly came together much more cleanly. We were back in business. In the meantime we had decided that the Tribal spells didn't need a specific mechanic tying them together, and just triggering all of your effects that cared about creature types was enough. So Mojo was killed from the set. , Sacrifice CARDNAME: CARDNAME deals 2 damage to target creature or player. If CARDNAME is revealed while exploring, it deals 2 damage to the exploring creature. One problem was that it was simply too high of a bar to have to assemble both cards that gave you treasure and also cards that could explore. Explore as a specific ability also made the mechanic parasitic, in that it only worked with cards from the set, which has become a death knell for many potential mechanics ever since the Kamigawa block. We worked through a bunch of problems with treasure, getting it to a pretty good place, but there was a lot of internal debate over the complexity of the mechanic. It really needed to show up heavily at common to be meaningful and interesting, which created a lot of pressure to simplify it. Eventually it was cut from the set instead, but not before inspiring the Hideaway lands. I liked it, but others felt it wasn't interactive enough, and Aaron decided to pursue other directions. Wizards employees aren't allowed to play in sanctioned Magic tournaments, so to scratch the competitive itch I had been playing a lot of the VS System card game from Upper Deck Entertainment. The Avengers set had recently come out, and one of the teams in that set was the Squadron Supreme. They were based around a mechanic where they grew incredibly strong when you managed to empty your hand (which was less crippling in that game than it was in Magic because you could put plot twists and characters in your resource row), and as such had a plethora of cards based around discarding. In a vacuum those cards would be quite poor, but in a well crafted Squadron Supreme deck they were devastating. While I'm not a fan of the VS System design in general, some of the most fun I've ever had playing a card game came out of drafting Squadron Supreme decks. I loved that they had such a strong identity and I greatly enjoyed the discovery process of figuring out how to make the deck tick. Many of the other teams in VS had their own theme that came through in the cards as well. One of my first pitches to Aaron was that we should use that as inspiration to make each of the tribes in Lorwyn feel unique and stand on their own. I'll include a few of my early card submissions for each race below to provide a better sense of their proposed identity. My initial proposal for Kithkin was that they should get bonuses for attacking and blocking together, comes into play effects that triggered if you'd already played a creature this turn, and some form of evasion (inspired by their great ancestor, Amrou Kithkin from Legends). 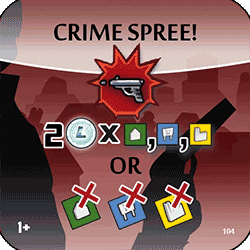 We eventually simplified this down and focused primarily on "attack with three or more", which actually showed up later in the Great Designer Search 2 as one of Shawn Main's mechanics. The problem we found with it was that it was either a trickle or a deluge. If you only had two creatures who could attack, you sat there doing nothing and would likely lose, but if you found that third creature, suddenly +1/+1s, regeneration, and other keywords all turned on and your combat steps would be a complete blowout. There was no middle ground and therefore few interesting games. They lost that mechanic but they kept an overall identity of small boosts, large numbers, and evasion, and attacking with lots of creatures lived on in Cenn's Heir. When CARDNAME attacks, if there are three or more attacking creatures, creatures you control get first strike until end of turn. When CARDNAME comes into play, if you've already played a creature this turn, put two +1/+1 counters on it. Attacking creatures can't be the target of spells or abilities this turn. Mojo - Attacking creatures also can't be blocked by creatures with power 3 or greater this turn. 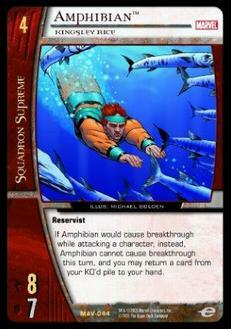 My proposal for Merfolk was that they were resource traders. Essentially, we would make a bunch of engine cards that turned one resource (life, mana, untapped creatures) into another, and if you assembled the right ones you could create machines that would slowly but surely give you an incremental advantage. This slowly converged to an emphasis on tapping and untapping, with rewards like milling your opponent, gaining life or drawing cards. We also added a subtheme of Islandwalk plus the ability to turn your opponent's lands into Islands. I love how the Merfolk turned out and drafted them at every opportunity when the set was finally released. Summon the School was a powerful card that made the whole deck come together perfectly. Whenever you draw a card, you may untap target permanent. 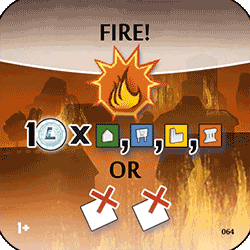 , discard a card: gain 4 life. Discard two cards: draw a card. We faced numerous challenges here. This was the first time Goblins had been primarily black, and aggressive Goblin decks had been extremely strong in Onslaught. We didn't want to add too much to those decks or have a similar metagame in Lorwyn. To that end I proposed that these guys would be the tricksters of the Lorwyn world. They wouldn't necessarily hurt you outright but they'd annoy you to no end by denying you resources or weakening your creatures. This didn't entirely work out, and we ended up using other tricks to keep them less aggressive, making cards like Mudbutton Torchrunner that were better on defense or with sacrifice effects than on offense, and other cards like Wort, Boggart Auntie that focused on bringing them back. The recurring aspect treaded on Zombie territory a little bit in exchange for some fun gameplay. : Target creature loses all abilities until end of turn. , : Destroy target creature that's already been targeted this turn. Until end of turn, target player can't draw cards. Mojo - That player also discards a card. Elementals were the only tribe that would be in all five colors, with the sentient "Flamekin" in Red and non-humanoid elementals in all five colors. This is where I initially suggested the "becoming tapped" mechanic should live, as at the time we had Mojo spells that played nicely with it. That got moved to Merfolk, and we eventually landed on Elementals being a combination of Evoke and activated abilities, with a subtheme of "use this ability three times in a turn". Evoke let us print a lot of expensive creatures that still had utility early in the game, and the activated abilities gave them a nice outlet for extra mana which made cards like Smokebraider and Soulbright Flamekin quite exciting. All in all, a success. Whenever CARDNAME becomes tapped, you may have it deal 1 damage to target creature or player. Whenever CARDNAME becomes tapped, you may untap another target creature. Mojo - Tap all non-flying creatures. This was a tough one. Elves hadn't ever been in Black before, and one of their more iconic cards was all about lifegain (Wellwisher). Lorwyn elves in particular were accomplished hunters. My first proposal was for them to be "more of the same with a slightly more evil twist" but late in design I hit upon a hunting mechanic that I liked. Many of the Elves would mark a creature (put a "hunted" counter on it) when they came into play, and then they would each have an ability that referred to hunted creatures, from outright killing them to whittling them down. We didn't use it though, possibly because of the counter problem (we were already using +1/+1 counters), and Elves ended up mostly focusing on creature tokens and +1/+1 counters. The hunting idea did, however, inspire Hunter of Eyeblights. , : Target creature gets +2/+2 until end of turn. Play this ability only during your upkeep. , sacrifice an Elf: Put a 1/1 black Elf Horror token into play. Creatures you control gain " : Add to your mana pool" until end of turn. Tribal - Elves you control gain " : Add to your mana pool" until end of turn. There was another team in VS, X-Statix, that had some interesting gameplay. They were all about having exactly one creature in play, and many of their creatures had ways to sacrifice themselves or would allow you to kill off your other creatures. While I didn't want to be quite as aggressive about it, I loved the idea of Giants in Lorwyn as loners who thrived by themselves, and it fit well with the evocative gameplay of Giants flinging other creatures to deal some damage before falling to their deaths. We didn't end up going that route, instead rewarding players heavily for having multiple Giants with creatures like Thundercloud Shaman to mitigate the fact that they were so expensive. CARDNAME gets -1/-1 for each other creature you control. While you control no other creatures, CARDNAME has Vigilance and can block two creatures at once. Faeries ended up being largely defined by a card called Sickening Faerie in design. I left a comment on the record in Multiverse saying, "Very good but I think he's at the right level to be the premier common Faerie creature". Sure enough, the card ended up being printed as-is as Dreamspoiler Witches and provided many drafters with a reason to pick up other Faeries like Spellstutter Sprite. The theme of flying creatures with Flash fit them perfectly. They also picked up some of the trickery that we moved away from the Goblins. : Until end of turn, you may play creature spells whenever you could play an instant. Target creature you control gains flying until end of turn. Mojo - All creatures you control gain flying until end of turn. The obvious qualities for Treefolk were huge amounts of toughness, keying off of Forests, and the Vigilance keyword. We gave them liberal doses of all three of these as well as some intriguing one-off designs like Doran, the Siege Tower and Lignify. One of the easiest tribes to design because their flavor fits so perfectly into Magic. When CARDNAME deals combat damage to a player, if it's untapped, you may tap it to destroy target creature. Mojo - Creatures you control get +1/+1 until end of turn. These were created to solve a simple problem. With 8 different tribes, even with Tribal cards, there would only be 1-2 cards for each tribe in a given pack. This was rough on both casual players with a favorite tribe and drafters, so the Changelings were created as a way to let everyone fill in their decks with some additional options. Many of the power/toughness changing spells in the set were also themed as Shapeshifter magic, letting anyone use them for their creature type triggers. At this point I knew that I wanted a subtheme of "sharing creature types" (e.g. destroy two creatures that don't share a creature type, or move an aura between two creatures that do) in Morningtide, so I was excited to have them in the environment. This was added very late in design after some all day offsite meetings at Mark Rosewater's house where we struggled to figure out what the non-tribal aspect of the set should be. Clash was nice in that it subtly rewarded Timmies for playing with expensive spells, yet everyone always had a chance to win the clash since their opponent could reveal a land. Yet Spikes strongly disliked the mechanic, because at the time you were told where to put the card, so there were no choices involved. We tried putting it on top, but it felt horrible when you needed a land, revealed a spell to a clash, and then had to wait to draw the useless spell. So we tried putting it on the bottom, but then everyone was sad when they were revealed a spell they were excited about and had to immediately lose it. The breakthrough was allowing the player to choose, giving it an element of Scry and appealing to the Spikes who could now use it to smooth out their draws. I won't bother trying to identify specific cards that I designed; in fact, at this point I had stopped even keeping track. Not because I designed so many that I couldn't remember them all, but just because once you were heavily involved with the overall shape of a set the individual pieces seemed less important. I did notice, going through my old files, that I submitted the first two abilities for Chandra Nalaar, which is particularly cool because of how hard Planeswalkers are to design (most of them end up getting re-made during development). The printed ultimate ability is far better than mine though; I submitted "Destroy all lands." I didn't yet have a grasp of just how powerful the planeswalker ultimates could (and should) be. And that, in a nutshell, was the process of Lorwyn design. If you have any questions about the design, or about specific cards, feel free to leave them in the comments and I'll answer what I can. The next post (the final one in the series) will be about Morningtide and the two digital games that I designed: ArtFight, and Alara Explorer. Thanks for reading! 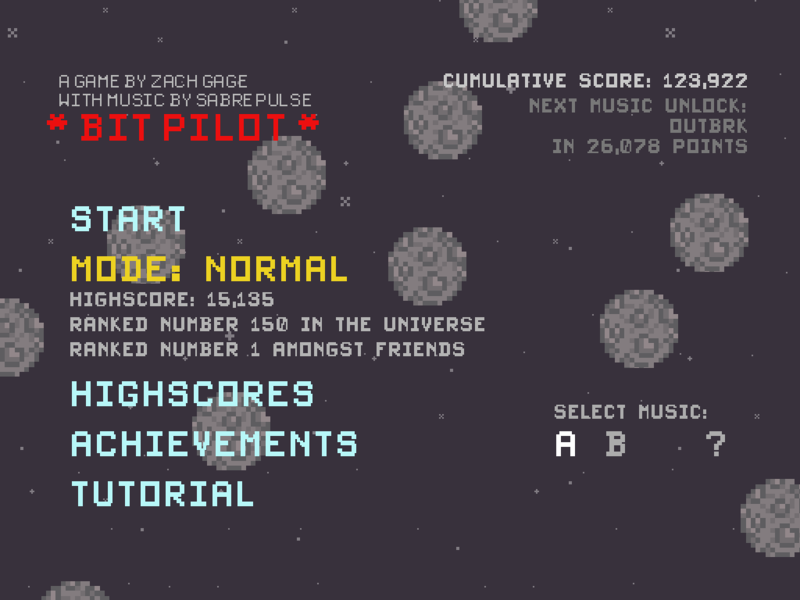 The goal of Bit Pilot is to stay alive as long as you can. Well, scratch that. The goal is to listen to as much of the music of Sabrepulse (an incredible chiptune artist) as possible, and the way you do that is by living as long as you can. You control a little ship in a huge asteroid field, with your only input being surprisingly tight touch-based movement controls. There are two powerups that occasionally float onscreen; a score powerup that grants 1000 points, and a shield powerup that grants 250 points and adds a hexagonal shield surrounding the outside of your ship. Each shield will block one asteroid that otherwise might kill you, but there's a catch: each one also makes your ship significantly larger. With no shields, you can nimbly slip through the tiniest cracks, but you're also instantly dead to any laser or asteroid that makes contact. 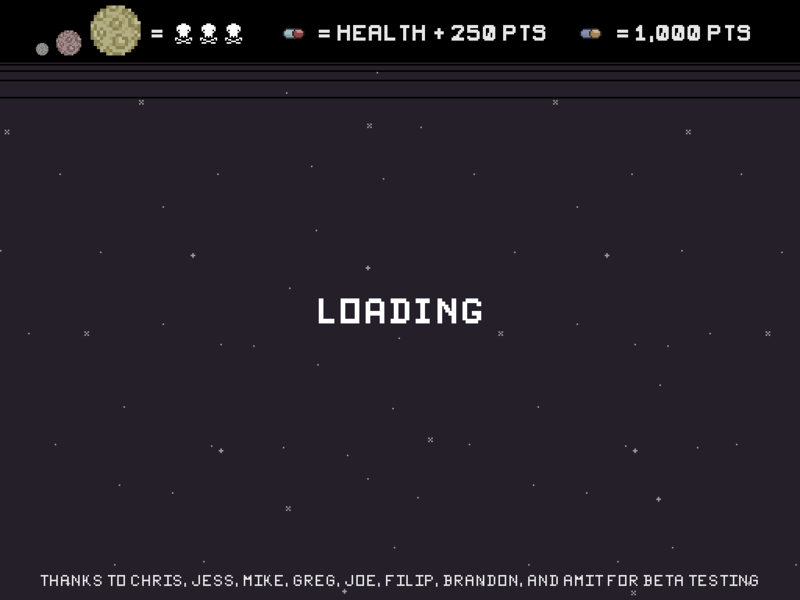 As with all games of this ilk, death equals starting over from the beginning. 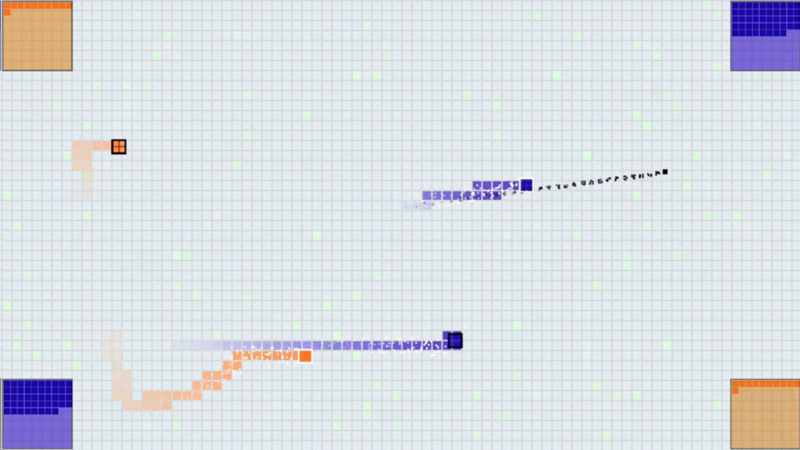 Recently I tweeted: "Bit Pilot's shields system is one of the best and most elegant examples of dynamic difficulty I've seen. Simple but brilliant." It keeps the game interesting for players of all skill levels. The basic goal of any dynamic difficulty system is to provide a suitable challenge without forcing players to self evaluate their skill level. (Since players tend to be fairly bad at the self evaluation, especially without enough context, and also are often incentivized to choose something far too easy in order to achieve unlocks or higher scores.) The system works admirably in this respect, as a strong player can build up a huge stockpile of shields, making it difficult to weave in between even the smallest asteroids. The difficulty increase is visual and directly player driven. A common problem with dynamic difficulty systems is that they're hard for players to comprehend. Once a player knows that something is going on behind the scenes but doesn't understand it, it's easy to feel cheated and blame the dynamic difficulty system for providing artificial challenge. In this case, though, it's easily understood because it's carried out in a visual way directly at the point of the player's greatest focus, the ship. It works towards solving a common problem with the genre where the early game is boring for strong players. I have a hard time playing any of these "survive as long as you can" (Canabalt, RunRunDash!, Monster Dash) games for long because the game experience gets worse the more skilled the player becomes. Not only does each individual game start to take longer, but there's also a steadily growing period of boredom at the beginning as you wait for the difficulty to ramp up. While the shields system doesn't completely solve this problem, it does mitigate it greatly, as you can now spend the early game trying to build up a reserve of shields to get you through the harder later stages, and manuevering with those shields is tricky. It turns getting hit from a negative experience into almost a positive one. This is a subtle effect that I think is actually quite important. Typically in these sorts of games, getting hit (or falling off a building, or whatever) is a strictly negative experience. There's nothing wrong with that, and in fact the whole game is built around avoiding it. In Bit Pilot, though, the fact that your ship suddenly becomes smaller changes the feeling completely without doing something drastic like removing challenge or consequence. So many times I've gotten hit and found myself thinking, "Sweet, I'm smaller now!". Most of these games have an arc that just slowly builds linearly and then eventually plummets off a cliff when you make a mistake. Bit Pilot's is more like a traditional roller coaster, with a steep initial climb and then numerous peaks and valleys. There's no question whether or not the shields are worth it. Another common problem with dynamic difficulty systems is that they will drastically warp player behavior. Oblivion is a famous example, with players intentionally staying low level while training critical skills and trivializing much of the gameplay. However, in Bit Pilot the shield powerups are obviously worth picking up, since an extra life is always worth having no matter how difficult the gameplay becomes (assuming it drops back down to the old difficulty when you lose the life, which in this case it does). I haven't found the system changing my behavior in negative ways at all. So there you have it. An incredibly simple design choice (each shield makes you bigger) with far reaching positive effects for the game. If you get a chance, try out the game and let me know if you agree or disagree.